Urumia, NW Iran, is the second largest city in the Iranian Azerbaijan and is the capital of West Azerbaijan. It is facing an environmental disaster as a result of Lake Urumia, the sixth largest saltwater lake on earth, drying up. You would think in a normal parliamentary election campaign rally, the sitting deputy's priority and that of his constituency supporters would be talking about how to prevent this looming calamity from happening. 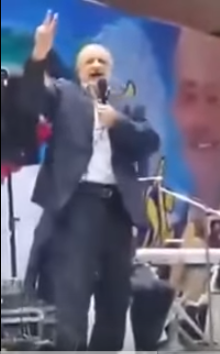 The video below, which went viral on the Iranian social media, is that of Nader Ghazipour, who was re-elected last week, talking in Azeri to his supporters during an election campaign rally. Far from having any concerns about the Lake Urumia, Ghazipour is more keen on displaying his self styled manly traits to win the votes. bullies have had their day. The era of tyranny is over, people have been freed, we have had a revolution, God brought Imam Khomeini for us. May God bless his two sons who have passed away. Let me tell you a recollection from the war. We took over the hills and positioned ourselves in the Iraqi trenches. It was 10 O'clock, I asked for 12 volunteers, 22 people volunteered, I said "I only want 12", they were fighting over it. I chose all the Azeris from amongst them, 13 Azeris including myself. We approached the Al-Amareh-Basra road, we faced 600-700 Iraqis, they all surrendered but we didn't have the means to keep them as prisoners, so we killed them all [crowds cheer]. May be there is no one amongst you who has ever had to chop the head of a chicken or a sheep, but I had to do it for the revolution, for Islam and for the martyrs [crowds cheer]. I set 700-800 tanks and armoured carriers on fire. Orders, came by noon that we should get back to our positions. We didn't get to where we are in this country to hand it over to kids and foxes. The Majlis is not the place for babies and donkeys [crowds cheer]. Majlis is no place for women, Majlis is for men [crowds cheer] You send women to Majlis, they will do things to them and bring shame on you, [crowds laugh]. 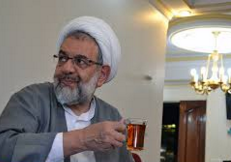 A week later he saw me in the Majlis, so he showed his side to all the others and said "Look what Ghazipour did to me", I said "why don't you show them your other part [arse] for them so they can really see what I did to you" [crowds laugh] Brothers, Majlis is not a place for poofs [crowds cheer] "
The election campaign speech finishes by Ghazipour saying how proud he is of his Azeri accent and those deputies who claim to be educated and have PHDs have mostly obtained those fancy titles with fake certificates after the revolution.